"We try to transition into winter here … we use low tunnels for some crops into the fall, and go into high tunnels as the weather turns. That way we make best use of our total space, reserving the most expensive real estate for when it is absolutely necessary…. "An important point is selecting correct varieties for winter growing. Another one is that watering is a big challenge. It is easy to overwater or underwater in the winter, so some of Johnny's tools like the moisture meter are important…. "Plants in high tunnels need air in winter, just as they do in summer… Fungus and/or aphid problems can develop if you do not provide good air circulation and venting of the high tunnel during the day. Also, heat management is more difficult by nature… We think, 'Well, it's cold outside; I won't go check the tunnels until 8 or so.' Then you realize the sun has been out for a couple of hrs and the temp inside has gone from 25 to 75 and rising — and that is not what greens and lettuces like! "Also important is having lots of organic matter in the soil, which leaves more air pockets in the soil, versus a solid block of frozen soil…. 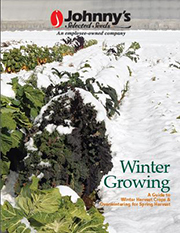 "Remember: in winter, high tunnels are your most expensive real estate, and you should consider all the costs vs. the returns of winter crops." Fundamentals of high tunnel design need to be observed to construct a tunnel that will survive snow load, capture optimal sunlight, and allow for regulating heat and humidity when necessary. To learn more, attend a seminar on high tunnel construction, or refer to the many resources available online and through schools, libraries, and universities. 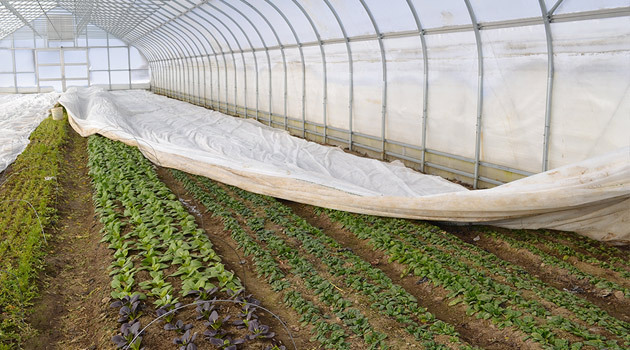 A proven strategy at higher latitudes is the use of one or more layers of row cover over the crops inside the tunnel, for additional protection in colder months. This row cover (especially when lighter weights are used) is sometimes left in place all the time. Other growers leave the crop covered at night and remove it on warmer days, when the tunnel's internal temperature has risen sufficiently. This results in increased solar gain, and ventilates excess moisture that can encourage certain diseases. With some crops the row cover can be laid directly upon the crop. With others, some type of support is required, especially if multiple layers or heavier fabrics are chosen. From QuickHoops ™ and wire wickets to cables and metal suspension frames, various methods can be deployed to support row cover and make the daily process of removal for heat and humidity regulation more efficient. 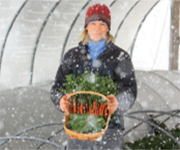 Keeping your high tunnel warm is not as essential as preventing dramatic temperature fluctuations. The key is to maintain as steady a temperature within the tunnel as possible, to reduce stress on the plants. Disease pressure can develop if you do not provide good air circulation and venting of the high tunnel during the day. The cold-hardy plants that we recommend can tolerate a solid freeze at night, provided they are allowed to thaw incrementally during the day. The plants must be completely thawed in order to harvest them, so supplemental heat may be required in the tunnel on harvest days. Thorough watering is necessary to get crops started, but they will generally require very little additional water during the winter. Using a moisture meter can help you avoid overwatering or underwatering. If you have to apply fertilizer, opt for mild, low-impact sources. Within the tunnel, salt build-up can pose a problem without the leaching action of natural precipitation. 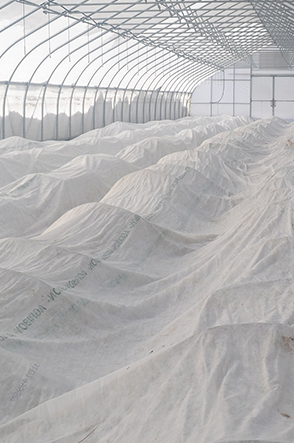 Some growers leave their tunnel uncovered periodically to allow rains to leach the salt.